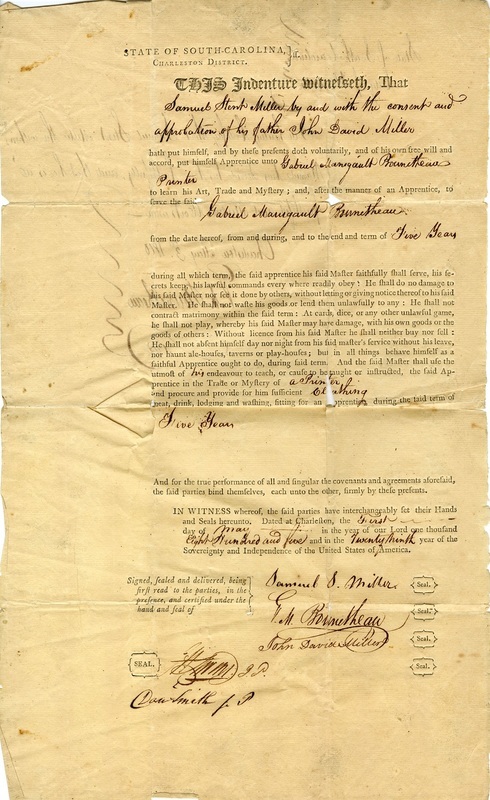 Samuel Miller apprenticeship indenture, 1805, courtesy of the South Carolina Historical Society. Samuel Stent Miller apprenticed himself to Gabriel Manigault Bounetheau, a Charleston, South Carolina printer, for a period of five years. Gabriel Manigault Bounetheau was a Justice of the Peace, Clerk of Council, and a printer with an office at 3 Broad Street, according to the Charleston City Directory of 1806. Until the early eighteenth century, the majority of Europeans who came to the Americas were not free settlers or elite landholders. They were indentured servants. In exchange for the cost of ship passage across the Atlantic, men and women from throughout Western Europe came to the Americas to work in a range of labor roles, from skilled trades to plantation agriculture. To pay for the cost of their travel, indentured servants worked for several years for a contract holder who did not pay wages, but did provide housing, food, and clothing. Despite some similarities to enslavement, indentured servants ultimately attained their freedom once they completed their contract, while enslaved people were permanently denied their freedom unless they could obtain the means to purchase themselves or successfully escape. In addition, in the seventeenth century various European colonies established laws ensuring that the offspring of enslaved women inherited their legal status from their mother, even if their father was free. Although intermarriage and sexual relationships between free European women and enslaved African or American Indian men did occur (particularly during early settlement), social stigmas and white male-dominated race and gender hierarchies meant that many interracial sexual relationships, both forced and willing, occurred between free or indentured European men and enslaved African or American Indian women. For this reason, a law linking enslavement to the mother's status effectively made slavery inheritable in the Americas. 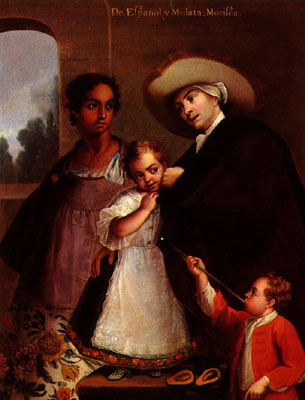 Spaniard and Mulatto, painting by Miguel Cabrera, 1763, courtesy of the Van Pelt Library, University of Pennsylvania. For European indentured servants, the guarantee of eventual freedom was significant, but many still collaborated with enslaved Africans and American Indians to run away, resist cruel treatment from shared masters, or to form rebellions. The close proximity of social status sometimes led to intermarriage between European indentured servants and enslaved Africans, and the exchange of cultural traditions and skills in the form of food, music, spirituality, and craft. Such interaction, including forced and willing sexual relationships, also occurred between elite slaveholding whites and enslaved people, but these relationships operated within the more coercive and imbalanced power dynamic of slaveholder and enslaved. By the eighteenth century, however, European indentured servants became more scarce and expensive to obtain. Fewer Europeans were willing to accept undesirable contracts in the Americas, particularly after rumors spread of the deadly conditions on American plantations. Elites in the Americas began to offer lighter labor treatment and special privileges to white indentured servants and free, non-slaveholding whites over enslaved Africans and American Indians. This extension of white racial privilege increasingly gave indentured and non-slaveholding Europeans an incentive to build stronger alliances with white elites. In exchange, slaveholding elites benefitted from a class of non-slaveholding whites who provided a protective buffer to help maintain developing race and class hierarchies in the Americas. For example, non-slaveholding whites could serve on patrols to help protect against slave rebellions, particularly as the numbers of enslaved Africans and their descendants in the Americas increased with the continued growth of the trans-Atlantic slave trade and Atlantic plantation economies. In regions where enslaved Africans held a numerical majority, white elites promoted multi-tiered racial hierarchies. In these areas, enslaved or free people with lighter skin tones (often due to mixed European and African or American Indian ancestry) received milder labor treatment or special privileges over dark-skinned enslaved Africans to again generate a protective buffer class to secure the institution of slavery. 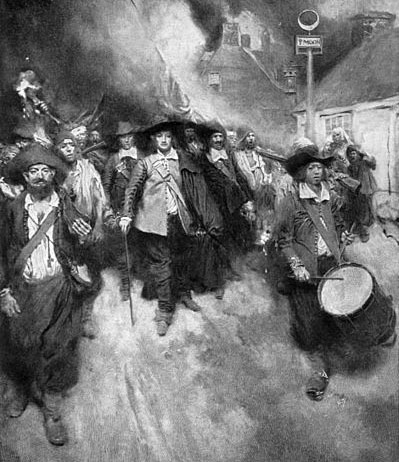 "The Burning of Jamestown," painting by Howard Pyle, 1905, courtesy of Canadian Libraries. During Bacon's Rebellion (1676-77), Nathanial Bacon organized Virginia settlers across race and class divisions to protest against the rule of Governor William Berkeley. On September 19, 1676, they burned the colonial capital of Jamestown, Virginia to the ground. The alliance between European indentured servants and enslaved Africans during the rebellion disturbed the ruling class, who subsequently passed laws to harden Virginia's racial caste system dividing free and indentured whites from enslaved blacks.